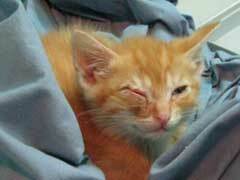 Feline conjunctivitis is one of the most common eye problems that affect cats. The conjunctiva is the covering of the eyeball and inside of the eyelid. When it gets inflamed or swollen, your pet has feline conjunctivitis. The cat’s eye will be very red. The third eyelid may cover part of the eye. Your cat may express sick cat symptoms by rubbing her eyes with her paws or by rubbing her face against furniture or your leg. This condition can be very painful to your pet. Conjunctivitis in cats has several possible causes. Foreign objects like sand can get in your cat’s eye resulting in irritation. Feline conjunctivitis can also be the result of allergies to pollen, mold, or household chemicals. If allergies are to blame, you cat will have clear, watery discharge from the eyes, just like people with allergies. Your veterinarian can do tests to determine whether the feline conjunctivitis is caused by allergies or it if is a cat eye infection. Infections are caused by bacteria, viruses or fungi. The type of treatment depends on the cause of the infection. If your cat has green or yellow discharge from the eyes or the eyelids stick together, she probably has an infection of some type. If you don’t have cat health insurance, you may be reluctant to take the cat to the veterinarian for evaluation. While there are some herbal preparations that can possibly reduce inflammation in your cat’s eye, you should realize that an infection can spread to other parts of the eye. Your cat’s cornea could become ulcerated. Other structures of the eye can be affected resulting in permanent damage or loss of vision. Conjunctivitis can also be the result of immunodeficiency disease in cats. Only your veterinarian can accurately determine the cause of the conjunctivitis.